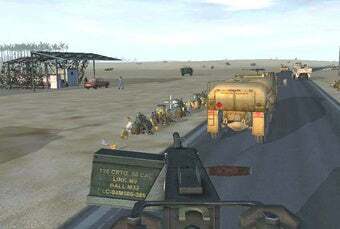 The U.S. Army has created a video game training unit that will begin operation in 2010, and has funding for it set aside to the tune of $50 million, reports Stars and Stripes. This isn't for recruiting or marketing, but the training of its soldiers in virtual environments. "The Army takes this seriously," said Lt. Col. Gary Stephens, of the Project Executive Office — Simulation Training and Instrumentation, which will supervise this unit. "We own gaming for the Army — from requirements through procurement." While the Army will not compete with video game development per se, nor is it producing commercially available products, it will still be interacting with the civilian games industry. The Army will be closely monitoring trends that may be able to help its video game training unit. It also has an undisclosed budget to purchase or have developed a state-of-the-art successor to its "DARWARS Ambush" trainer (pictured), basically an FPS with 20th-century technology limitations.The new trainer, "Game After Ambush" will require much stronger technology, including support for more trainees participating at the same time, full-featured terrain and scenario modification, and playback/review capability so that instructors can assess trainees' tactics and choices. It sounds like they want to get this up pretty soon. Leslie Duvow, project director for gaming at PEO-STRI, said the Army will have 70 gaming systems in 53 locations in the United States, Germany, Italy and South Korea between February and September 2009. "Each system will consist of 52 computers with ancillary equipment including steering wheels, headsets and mice," she said. Soldiers will be able to drive virtual vehicles, fire virtual weapons, pilot virtual unmanned aerial vehicles and do "most anything a soldier does" in a virtual battle space as large as 100 kilometers by 100 kilometers, she said. [Col. Mark] McManigal [of Training and Doctrine Command] said the game will replicate what soldiers encounter on today’s battlefield — from fighting in urban terrain and convoy operations to reacting to contact and ambush operations. "Your imagination will be your only limiting factor," he said.